It’s a beautiful and hot summer’s day when Ankit Sharma and I first arrive at Peace Nursery and Primary School located in Makindye, a suburb a fair distance from the bustle and hubbub of downtown Kampala, Uganda. We are immediately mobbed by young schoolchildren in recess, enthralled with the two tall white men who have just arrived. To them, holding our hands is the highlight of their day, as they meticulously study the differences between our physical appearance and their own. All in all, it’s a welcome fit for the arrival of a superstar, not for two college engineering students. But needless to say, we don’t mind and definitely can’t help but smile and laugh with them. 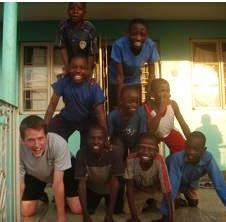 University of Colorado Civil Engineering undergraduate Andy Hemphill (bottom left) builds a pyramid with Peace School children. Our time at the school was divided into two parts. We were there for four days at the end of June to evaluate past and potential energy projects. And we were there for about 10 days at the end of July to oversee two major projects: the installation of two-300 litre solar thermal water heaters, and the reconstruction of institutional Rocket Stoves in the school kitchen. The school’s new solar hot water heating system now provides warm water for hand washing (before meals) bathing, laundry, and washing dishes. The new stoves replace earlier models that were not constructed to true Rocket stove standards. When Rocket stoves are correctly built they cook food faster, release fewer emissions, and use less wood, thus saving the school hundreds of dollars over the course of their lifetimes. 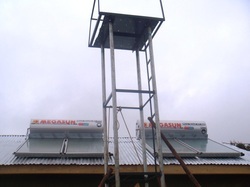 Two 300-litre solar water heaters were installed on the rooftop at Peace School in July. A pump feeds harvested rainwater to an elevated tank, which then flows to the heaters. The elevated tank was not yet been installed when this picture was taken. Learning how the two systems work was great for us because as engineers, we love to know “how things work”. In addition to project work, we found time to interact with the schoolchildren. Not only did we get a chance to teach them, but they also taught us about Uganda and their culture. It was a great exchange, interspersed with a lot of fun. Overall, Ankit and I immensely enjoyed our time at Peace Nursery and Primary school and eagerly await a return in the future. 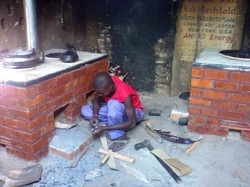 Patrick Bisere, Director of Prime Energy and Environment Savers Ltd., builds new institutional “Rocket” stoves for the school.